Last night's dinner was yet another keeper: Quick Tagine-Style Chicken. 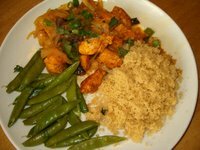 This meal includes cous cous in the recipe and I also made some sugar snap peas that could not have been easier to prepare. I cut the recipe in half and it turned out very well, but I still made the entire spice recipe. Here's the recipe with my comments in brackets. Heat a large nonstick skillet over medium high heat. Add extra-virgin olive oil, 2 turns of the pan, in a slow stream, and add smashed garlic. Season the chicken with seasoning blend [this means the montreal seasoning blend, not the spices blend]. Scatter chicken around the pan in an even layer. Cook chicken pieces 2 minutes on each side to brown, then add the onions, prunes, raisins and stock. Mix spices in a small dish and scatter over the pot. Cover and reduce to moderate heat. Cook 7 or 8 minutes, remove the lid and stir. Uncover chicken and cook another 2 to 3 minutes to thicken slightly. Adjust the seasoning, to taste, and serve chicken on a bed of couscous. Garnish with chopped cilantro and scallions. Serve with chutney.